A month by month guide to Thailand's most celebrated festivities. It matters not whether the weather is hot, cool or rainy here because everyone loves celebrating outdoors. And what amazing events there are to celebrate too. Some are religious, some are commercial, some are cultural and some are simply great fun. Thai people love their festivals and invite you to join in with all these joyous occasions. Western events such as Valentine's Day, Christmas Day, New Year and Halloween are also enjoyed by the locals here too. Songkran festivities are celebrated in the hot season during the month of April and you are more than welcome to join in this infamous water throwing event. Traditionally, young Thai people will grab hoses, buckets and water pistols for "attacks" on anyone and everyone, day and night. The Candle Festivities in July celebrates the commencement of Khao Phansa with a truly spectacular event. Beautifully decorated beeswax candle processions are ceremoniously paraded around the city before being presented to the temples. Visakha Bucha festival is celebrated during the rainy season in late May and early June and marks Buddhism's holiest date when Lord Buddha was born, enlightened and died. Loi Krathong is celebrated on the night of the full moon in the cool season during the month of November. This is Thailand's most enchanting festival and is celebrated throughout the country by the locals making offerings to the water spirits to cleanse them of past sins and to restore good luck. Royal Ploughing Ceremony is a colourful and ancient tradition held on the 10th May at Sanam Luang in Bangkok only. It is presided over by the crown prince and marks the official start of the rice planting season. Pra Buddha Chinarat Fair is celebrated in honour of this most sacred Buddha which is enshrined at Wat Phra Si Rattana Mahathat at Phitsanulok in Northern Thailand. Not only is this a religious festival, there are numerous kinds of entertainment at this fair. You can watch local theatre as well as Ram-Wong dancing, a kind of folk dance to the rhythm of drumbeats. This fair includes a display of large straw birds. Don Chedi Memorial Fair is an event that lasts for seven days in the town of Suphanburi in Central Thailand to commemorate the epic battle fought and won by King Naresuan against the Burmese in 1592. This victory is still celebrated today with lots of entertainment for everyone. Bo Sang Umbrella Fair is held in the main street of Bo Sang, a village near Chiang Mai. This fair celebrates the tradition and skill of umbrella making as well as other handicrafts. Painting exhibitions together with cultural performances and the Bo Sang beauty pageant are held here. Chiang Mai Flower Festival is an annual three-day festival held during the first week of February. A good time to visit the Northern Province. There are beautiful Thai and Hill Tribe Girls in traditional dress aboard floats, decorated with a variety of exotic flowers. You can witness this joyous occasion with a beauty contest to celebrate the crowning of Miss Flower Festival Queen. Plenty of plants and flowers on display for sale. 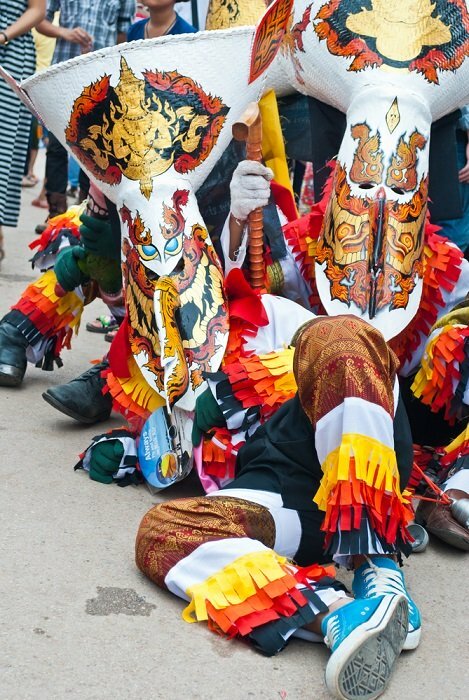 Dragon and Lion Parade is a February festival celebrated in the town of Nakhon Sawan in Central Thailand by local Chinese ancestry. This most colourful procession which is accompanied by some lively marching bands with lots of dragon and lion dances is a tradition to pay homage to the golden dragon deity in gratitude for his benevolence to mankind. It all ends with a beautiful dazzling display of light and sound. Makha Bucha is an important religious holiday for everyone and is held during the time of the full moon of the third lunar month. 1,250 disciples gather at various temples around Thailand to pay homage to the Lord Buddha. This is a day of merit-making and sermons that end with candle-lit processions around the temples. Kite Flying Events take place in Thailand between February and April. These festivities occur during a period when the south-west monsoon blows over the Gulf of Thailand and marks the end of the rice-harvesting season. One of the main kite flying events is held during the afternoons at Sanam Luang in Bangkok. The sky there is filled with enormous, brightly coloured kites in various shapes and sizes, including dragons, bears, clowns and some very unusual ones too. During the month of march dozens of participants from around the world take part in the annual kite flying festival in the town of Phetchaburi south of Bangkok. Barred Ground Dove Festival is a dove lover's delight whereby many Asians from Singapore, Malaysia and Indonesia as well as Thailand, gather in the southern city of Yala to celebrate this special occasion. The highlight is a dove-cooing contest, including well over 1,400 competitors. Prize doves, as well as other local products, are on sale at this event. Chakri Day is celebrated at the Grand Palace on 6th April to commemorate the founding of the Chakri Dynasty in 1782 of which the present monarch King Bhumibol is the ninth king. Though it's an official public holiday, public ceremonies are not held on this particular occasion. Thai New Year is officially celebrated from April 13th-15th but can vary from city to city by a few days. This is the time of the hot season and the time when most normally placid Thai's let off steam. It also means the chance to sprinkle, spray or more importantly throw bucket loads of water over friends, neighbours and anyone else who happens to get in their way. This of course also extends to any foreigner who might pass by. And translated, that means you too. This water festival is commonly known as Songkran. Turtle Releasing Fair Held at Nai Yang beach in Phuket. Young baby turtles are released into the sea to mark the beginning of their journey. There are three public holidays in May. One is Labour Day on May 1st. Another is Coronation Day on May 5th which is a private royal affair and the third is Visakha Bucha held on the night of a full moon in May. The Rocket Festival is a festivity held in the northeast of the country where you can witness the launching of locally made missiles of all shapes and sizes. Some of them taller than humans. Can be a lot of fun but could also be a little dangerous. You never quite know where these rockets are going to land. Not that many tourists get to see this spectacular event as it is not on the most popular tourist route. Royal Ploughing Ceremony is an ancient tradition celebrated on the 10th May at Sanam Luang in Bangkok only. It is presided over by the crown prince and marks the official start of the rice planting season. Crimson-clad attendants lead sacred white oxen, drawing old fashion ploughs around a specially prepared field. The minister of agriculture follows behind scooping rice seeds out of buckets, held by pretty Thai maidens. He would then sow the seeds into furrows left behind by the ploughs, while accompanied by the blaring of conch shells and drums. Visakha Bucha is a Buddhism's holiest day when the Lord Buddha was born, achieved enlightenment and died. All three of the events are said to have happened on the very day. Devotees make merit by bringing food to the monks in the morning and during the evening candlelight processions and sermons are held at temples throughout the country. Sunthorn Phu Day is for literary and poetry lovers alike. This annual celebration is held in late June commemorating the birth of the Thai poet Sunthorn Phu. This festival of events in June includes dramatic performances and puppet shows depicting the poet's lifelong works. Blooming Krachiao Flower Show takes place from 1st June until 31st July at the Siam Tulip Festival of Chaiyaphum in the Pa Hin Ngam National Park. The park is in Saraburi on the edge of the Phetchabun mountain range and the Khorat Plateau. The International Dog Show usually takes place between 30th June and 3rd July at the Impact Exhibition and Convention Center in Bangkok. They get bigger and better year after year as more than 200 local and international exhibitors showcase the very latest range and trends of dog-care products and services as well as a host of exciting and innovative in-show activities, competitions, seminars and workshops. Grand Sale Shopping Festival is another very good reason for being here during this time. It's the best time to come shopping. Yes! with up to 70% off all regular priced goods and services between 1st June and 31st August. 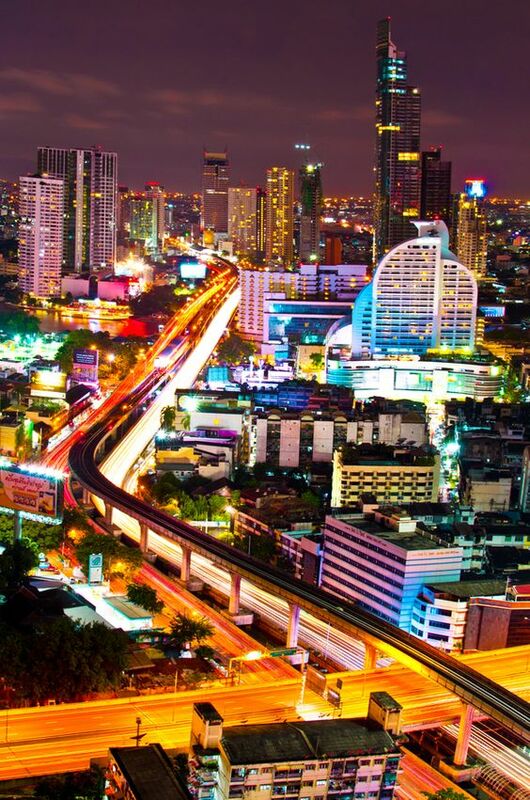 This amazing shopping experience is extended to all the key tourist destinations of Bangkok, Pattaya, Phuket and Chiang Mai. Asalha Puja is a religious event held on the night of the full moon in July which celebrates Thailand's third most important Buddhist holiday. On this occasion, Lord Buddha preaches his first sermon to his first five disciples. This is also the beginning of the three-month season of Lent. Khao Phansa follows immediately after Asalha Puja when Buddhist monks must abstain from drinking alcohol and the taking of any drugs. They must then lead a more appropriate lifestyle. Monks can reside in a temple of their choice but must remain there for three months. They are forbidden to stay in any other temple until the Lent is over. Food and refreshments are brought to the temples for the monks during this period. The reason for this is to stop the monks from going about their normal daily rounds and accidentally trampling on new rice shoots that local farmers have recently planted for the coming of the rainy season. The Candle Festival takes place during Khao Phansa in the northeastern town of Ubon Ratchathani. It celebrates the commencement of Khao Phansa with a truly spectacular event. Beautifully decorated beeswax candle processions are ceremoniously paraded around the city before being presented to all the temples in the province. The main event during August is marked by Her Majesty Queen Sirikit's birthday on August 12th. On this special occasion and to honour Her Majesty Queen Sirikit's royal birthday, locals decorate public buildings such as the Grand Palace in Bangkok with lots of beautiful decorations including colourful lights. Mothers day is also celebrated on this day. Rambutan Fair Festival is also celebrated each year during the month of August in the province of Surat Thani. This is where the first Rambutan Tree was planted in the early 1900's. Each year, the Rambutan fair is held to highlight this particular fruit. The fair also includes exhibitions of other local products and floats that are adorned with Rambutans. There are many other exhilarating fun-filled activities to join in during this time. Read more here. The Phichit Boat Race is a type of regatta festival featuring a variety of extremely long boats, but not to be confused with the longboats that you encounter around the islands in the south. This traditional event takes place in Phichit located at the far end of the central plains, north of Bangkok. The race itself is set on the Mae Nam Nan River in front of Wat Tha Luang temple. The race has tremendous pride among the locals and takes place on the first Saturday and Sunday in September every year. Taan Khuay Salak is a succession of similar dragon boat races celebrated on the Nan River between September and October. The Chinese Moon Festival is one of the Thailand festivals held in honour of the Chinese moon goddess. The event usually takes place on the 15th day of the eight lunar month, as it is believed to be the date in which the moon goddess was born. It is usually conducted by women folk as Chinese people believe that the moon is uniquely associated with the female deity. Other forms of small shrines laden with fruit, candles and incense are placed in front of homes to honour the moon goddess. The Chinese Vegetarian Festival is a joyous occasion where you can feast on a whole host of delicious vegetarian delights. These vegetarian feeding frenzies are held from late September until early October. The vegetarian festivities held on the southern island of Phuket delivers an even bigger fascination in the form of a body piercing spectacular. Ok Phansa is one of the Thailand festivals celebrating the end of lent and the rainy season. It's a day of merit-making in which Buddhists travel far and wide offering new robes and gifts to other Buddhists monks at temples around the country. It's also the start of the Kathin season, and so after spending three months practising meditation, these Buddhists monks can now return to their normal daily duties. Chulalongkorn Day ceremony is held every year on 23rd October to honour one of Thailand's best-loved and respected kings. It was on this day in 1910 that King Chulalongkorn (Rama V) passed away after reigning for some forty two years. Each year during an afternoon ceremony, wreaths are laid in his honour in front of his statue in the plaza of the old National Assembly building in Bangkok. The Chonburi Buffalo Race is held around the time of the full moon in October and normally on a Sunday afternoon. Thousands of mostly locals flock to this hysterical event in the town of Chonburi (70 kilometres) south-east of Bangkok. It's similar in style to the Kentucky Derby, but instead of racing horses, here locals race water buffaloes. The Golden Mount Fair is one of the most popular Thailand festivals held annually at Wat Saket Temple in Bangkok for a period of seven nights and eight days. It's a fair said to commemorate and worship the Buddha's relics enshrined inside the mount on the temple grounds. Loi Krathong has to be one of the most beautiful of all the Thailand festivals. It's held on the night of the full moon during this cool season. It's also the country's most enchanting festival and is celebrated throughout the land by locals and foreigners who make offerings to the water spirits to help cleanse them of past sins and to restore good luck. Phra Pathom Chedi Fair is a grand affair held at the world's biggest Chedi in Nakorn Pathom 60 kilometres (38 miles) west of Bangkok. This particular fair is regarded as one of the most exciting in all of Thailand. You can spend the whole day leisurely strolling around the vast grounds to view the numerous stalls selling just about anything and everything. The Khon Kaen Silk Fair is an annual festivity held in the northeastern town of Khon Kaen some 445 kilometres (270 miles) from Bangkok. Silk demonstrating events are staged in front of the city hall and in Ratchadanusorn Park lasting a week. It's a good opportunity to observe actual Silk Production and to perhaps purchase some of the products. Bridge on the River Kwai sound and light show festivities is a rather garish spectacle and not one that I personally approve as it seems more apt to commercialising one of the worst atrocities of World War II, that of the Death Railway that runs between Thailand and Burma. His Majesty the King's Birthday is celebrated on 5th December with a private ceremony and party held at the Grand Palace in Bangkok. While this may be for officials and guests only, if you do happen to be here on this day you can visit the magnificent Wat Phra Kaew temple instead. Trooping of the Colours is one of the most impressive Thailand festivals featuring the elite royal guards who are all dressed splendidly in various chic and colourful uniforms. These guards will then have to swear new allegiance to the King at this annual oath-taking ceremony after which they then parade past members of the Royal Family. The ceremony is held each year on 3rd December at the Royal Plaza.